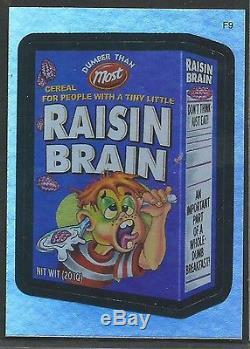 Wacky Packages ALL NEW SERIES 3. 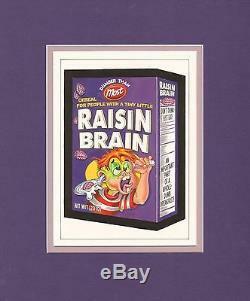 PUBLISHED STICKER #F9 FOIL RAISIN BRAIN. This title was also uses as ANS9 Motion Tag #5. This is the original art used to make the sticker. It is not a reproduction. 6" X 8" on thick board. It comes matted and framed by Topps. It also comes with the original Topps Vault Certificate of Authenticity. Smokin' Joe McWilliams just informed me that he did this art and not Joe Simko. 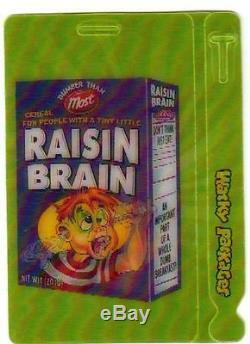 The item "TOPPS VAULT Original Comic Art WACKY PACKAGES ANS 3 RAISIN BRAIN JOE SIMKO" is in sale since Monday, December 19, 2016. This item is in the category "Collectibles\Comics\Original Comic Art\Covers". The seller is "make_mine_marvel_1973" and is located in New York, New York.